Sam Lear on the attack for Alcester 2nds. Picture by Debbie Burgess. 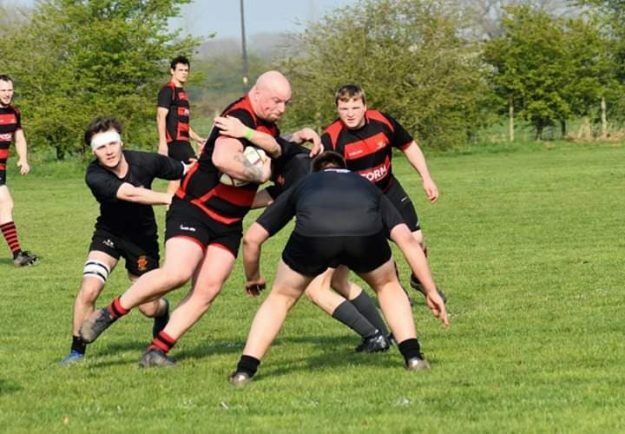 ALCESTER 2nds took centre stage with a 41-5 victory at Atherstone 2nds on a Saturday in which the Kings Coughton men’s first team opponents forfeited the fixture. Bottom side Upton failed to field a side for the scheduled Midlands Three West (South) game at Alcester, who are left to complete their season with a visit to Woodrush on Saturday. A win would complete a league double over The Rush and could leapfrog Alcester over their hosts into seventh place, although Woodrush have a further fixture to play. Alcester 2nds were in no mood to mess about and gained the early ascendancy as they demonstrated their powerful pack with a pushover try within the first minutes which Glyn Smith converted. Smith then doubled his side’s lead after spotting gaps in the home side’s defence to score under the posts and then kick the extra points himself. After half an hour, Atherstone scored their first and only try of the match before Alcester went on to score one more before half-time courtesy of Luke Spencer who also kicked the conversion. Alcester went into the break with a 21-5 lead and continued to dominate in the second half in which they scored four more tries. After returning from a few weeks away from the game, Antony Cauvin proved he was no stranger to the whitewash as he crashed over for the first second half try. It was down to the wingers to complete the afternoon’s scoring as Stephen Mason bagged a brace and Lewis Walker added one to the try tally. The 2nds entertain Birmingham opponents Dixonians 2nds on Saturday.